selected artworks and fragments from the Fondazione Santarelli. John Baldessari I Am Making Art (1971) and Baldessari Sings LeWitt (1973), Elisabetta Benassi, Son of Niobe (2013), Ketty La Rocca Appendice Per Una Supplica (1972), Mario Merz, Lumaca (1970) and Ad Reinhardt Travel Slides (1952-1967) will be shown alongside a selection of works from the Fondazione Santarelli including: Giove Eliopolitano III AD, Greek female head I BC, arm fragment II AD, torso of Alexander the Great III AD, fragment of striated sarcophagus II AD, Pinax with theatre masks I AD, Etruscan high relief of Perseus and Medusa V BC and a cleric from Palmyra III AD. changes to the historical building have been made by the British consul among the Vatican Giovanni Freeborn, the engineer, architect and oenologist Giovanni Gabet and by the first director of the American Academy in Rome Samuel A.B. Abbott. The Collezione Dino ed Ernesta Santarelli spans from the Ptolemaic period until the XIX century with a particular interest on Roman statuary and coloured marbles from Imperial Rome, architecture fragments and painting on stone. There is also an extensive collection of Glyptic art, spanning across five millennia, which is in loan at the Capitolini Museums in Rome. Private view: Wednesday 16 May, 6pm to 9pm. Tuesday – Saturday and by appointment. The exhibition is in the former garage of Villa Lontana, designed in 2010 by architect Fabio Ortolani. This entry was posted in Staff, Students and tagged Jo Melvin on May 9, 2018 by Nick Tatchell. Jeffrey Isaac will be speaking about his work with Jo Melvin in the Green Room at Chelsea College of Arts, 16 John Islip Street, SW1P 4JU on January 31 2017, at 4.45. This entry was posted in Events, Staff, Students and tagged archives, Jeffery Isaac, Jo Melvin, Sol LeWitt, Special Collections on January 20, 2017 by Nick Tatchell. Pangaea Sculptors’ Centre (PSC) was delighted to host Life Cycle, Continuous on 3 December 2015. This evening of talks and discussion considered the life cycles of artworks, alongside the legacy of their artists, exploring in particular how these things transform, evolve and transition across platforms, people, places and time. The evening began with a few words from the organisation’s co-directors, Dr Marsha Bradfield, Visiting Scholar at CCW, and Lucy Tomlins. The life cycle of artworks, especially sculpture, is something that has preoccupied PSC since the summer of 2013, when the organisation hosted an artist talk by sculptor Richard Wilson at his Slice of Reality on the Greenwich Peninsula. Here Wilson spoke candidly about the challenges of maintaining the public artwork, a chunk of ship, after the millennial project was decommissioned. Who takes decisions about an artwork’s care after it leaves its artist’s orbit? What responsibility do artists have to how their artworks are stored, shown, conserved or disposed of? Where does the work reside? Does it reside in the work that we look at? Does it reside in the idea of the work? These were questions that CCW Reader Dr Jo Melvin engaged in her talk, The conundrums of remaking sculptural practices and their legacies. Melvin has been investigating the interconnections between the archives of artists’, critics, museums, galleries and magazines from the 1960s to the present day since the early 90s. For Life Cycle, Continuous, she considered specific conundrums in connection with re-presenting the work of Naum Gabo, Barry Flanagan and Christine Kozlov. For instance, she referenced the exhibition of Gabo’s Kinetic Construction (Standing Wave) at MOMA in 1968. When the artwork, owned by Tate, proved too fragile to travel, the possibility of whether it might be remade in the US came to the fore. Gabo agreed on the grounds that like Kinetic’s previous iteration, the artwork should be made from materials that were ‘ready to hand’. Crucial here is the artist’s specification. For as Melvin observed, without clear instructions about what conditions must be fulfilled for an artwork to be remade or represented, ambiguity pervades. She went on to discuss the challenges of identifying what and where the artwork is with reference to Barry Flanagan’s practice and his sense that his sculptures were not based on experience of the world but rather, each work is an experience of its making. Further, discussion of Christine Kozlov’s 271 BLANK SHEETS OF PAPER CORRESPONDING TO 271 DAYS OF CONCEPTS REJECTED touched on the thorny of issue of what traces slip away, either because they are perceived as unworthy for posterity or undesirable in some way. And in the case of this particular work by Kozlov, what is most important: concept or materials? Should only the 271 blank sheets the artist selected be shown, however yellow they become with age? Would would any ‘bank sheets’ serve to gesture towards the absence of presence that her artwork explores? The other two speakers for Life Cycle, Continuous grappled with very different concerns in their talks. Artist Anne Hardy discussed the challenges of re-presenting site specific works like those recently featured in her acclaimed exhibition FIELD at Modern Art Oxford. 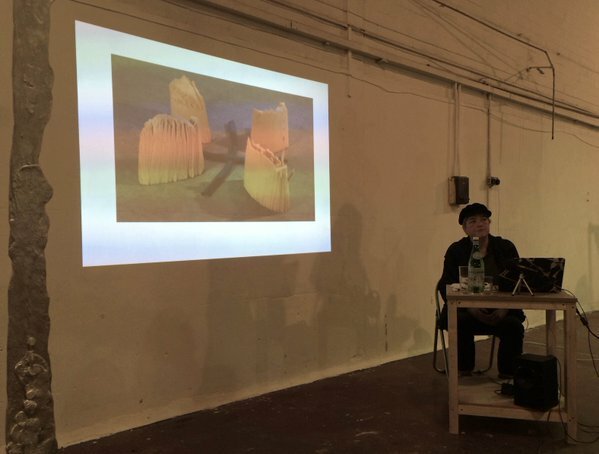 Artist and senior lecturer Jenny Dunseath Senior Lecturer at Bath Spa University discussed her ongoing research into the transmission of knowledge from artists to their assistants, based on her personal experience working in Anthony Caro’s studio. Life Cycle, Continuous was part of the public programme that accompanied PSC’s 2015 artists-in-residence programme, with the talks talking place culminating exhibition, Which one of these is the non-smoking lifeboat? This approach to hosting the talks tracks with PSC’s ongoing commitment to making the making of sculpture more visible so as to better appreciate the process of an outcomes production. Audio documentation of Life Cycle, Continuous will be available on PSC’s website in early 2016. This entry was posted in Staff and tagged Anne Hardy, archives, Barry Flanagan, Christine Kozlov, Jenny Dunseath, Jo Melvin, Marsha Bradfield, Naum Gabo, Pangaea Sculptors’ Centre, sculpture on December 17, 2015 by Claire. On Monday 7 December 2015 at 5.30, Art & Language will present a screening of their film Qui Pourra, 2007 in the Banqueting Hall at Chelsea College of Arts. This launch event will be their first as Visiting Professors at UAL. This short film focuses on the studio and the Art & Language’s collaborative dialogic practice. It uses Courbet’s The Artist’s Studio; A real allegory summing up seven years of my artistic and moral life, 1854-55 as its starting point. The screening will be introduced by Jo Melvin and it will be followed by a panel discussion with Michael Baldwin and Mel Ramsden. When conceptual art, performance, happenings and the so called ‘new art practices’ exposed the cracks of modernism’s exclusivity the activities of Art & Language have provoked reflexive enquiry, practical variety and resilience to easy categorisation. The tactics they employ incorporate performance, sculpture and painting to question genre, language and context brings a humorous ambiguity to the status of the art object, and its critical audience within the parameters of its institutional and historical framework. Their most famous work is Index 01. It was first shown in the groundbreaking Documenta 5 1972. In 1997, Art & Language were nominated for the Turner Prize, Tate in 1986, they had a major retrospective at MoMA PSI, 1999 and most recently Art & Language Uncompleted MACBA, 2014-15. The name Art & Language was first adopted in 1968, to refer to a collaborative practice that had developed over the previous two years between Michael Baldwin and Terry Atkinson, in association with David Bainbridge and Harold Hurrell. Over the next several years it stood for a collaborative practice with a growing and changing membership associated with the journal Art-Language, first published in May 1969, and subsequently with a second journal The Fox, which was published in New York in 1975-6. Joseph Kosuth was invited to act as American editor of Art-Language in 1969. In the following year Mel Ramsden and Ian Burn merged their separate collaboration with Art & Language. Charles Harrison became editor of Art-Language in 1971. By the mid 1970s some 20 people were associated with the name, divided between England and New York. From 1976, however, the genealogical thread of Art & Language’s artistic work was taken solely into the hands of Baldwin and Ramsden, with the theoretical and critical collaboration of these two with Charles Harrison who died in 2009. The screening is free and can be booked online. This entry was posted in Events and tagged Art & Language, Jo Melvin, Mel Ramsden, Michael Baldwin, Qui Pourra on November 18, 2015 by Claire. On 14 and 15 October CCW Graduate School and Chelsea College of Arts will be hosting Action Space Inflatable. The inflatable is a re-versioning of pneumatic structures built by Action Space in the late 1960s and early ’70s. Over two days members from Action Space, Inter-Action and Artist Placement Group (APG) among others, will explore the relevance of community arts programmes of the ‘70s and ‘80s to contemporary artistic practices. Through workshops, performance, a walking tour, film screenings and discussion, this event will open up questions about art as a democratic tool, educational medium and instigator of social change. The Action Space Inflatable structure has been specially commissioned as part of an experimental film project by filmmaker, Huw Wahl. This two-day event marks the first stage of the UK tour of the inflatable and is presented by CCW Graduate School as part of Chelsea College of Arts’ celebration of ten years of creative activity at Millbank. On Wednesday 14 October, founding member of Action Space, Ken Turner, will deliver a performative lecture; CCW Research Fellow Mo Throp invites you to participate in the Inter-Action Trust Games Method session, as well as a programme of archival footage from Action Space, Inter-Action Trust and Artist Placement Group (APG) projects will be screened inside the inflatable. The day will close with a panel discussion on Socially engaged practices of the 1970s and their relevance today, chaired by Marsha Bradfield and including Joshua Y’Barbo, James Lander, Barbara Steveni, Mo Throp and Ken Turner. On Thursday 15 October artist Barbara Steveni, of APG, and Jo Melvin invite you on their Walking Tour from Manresa Road – site of the original Chelsea School of Art – towards the current Millbank venue. The day concludes with a conversation between Barbara and Brian Chalkley focusing on APG’s ‘Not Knowing’ in relation to Chalkley’s pedagogical methods for teaching on the MA Fine Art course at Chelsea College of Arts. The conversation will be facilitated by Jo Melvin. Mo Throp spent five years in the 1970’s as a live-work member of Inter-Action, a community arts organisation which became one of the UK’s best known and most influential cultural and social enterprises. Its projects included the Almost Free Theatre in the West End (notable seasons and events included London’s first Black Power, Gay and Women’s theatre seasons), the Dogg’s Troupe – a street theatre group, the Fun Art Bus, the Media Van, a city farm, a publishing unit and one of London’s first Free Schools. ‘My time with this organisation has certainly influenced my pedagogical approach as a teacher of Fine Art students and my relation to art practice and my work with the Subjectivity & Feminisms Research group at Chelsea. This entry was posted in Events and tagged Action Space, APG, Artist Placement Group, Barbara Steveni, Brian Chalkley, Huw Wahl, Inter-Action, James Lander, Jo Melvin, Joshua Y'Barbo, Ken Turner, Manresa Road, Marsha Bradfield, Mo Throp, Socially engaged practice, Subjectivity & Feminisms on October 6, 2015 by Claire. Friday 27 March sees the launch of issue 2 of CCW Graduate School’s journal Bright Light. The Bright Light series focuses on the latest debates in the arts and design and provides a way of seeing how practitioners are taking fresh perspectives on key questions facing designers, fine artists, lens-based media practitioners, curators, archivists and critical theorists. The Bright Light series is edited by Dr David Dibosa, CCW Senior Research Fellow and Course Leader of the MA in Curating and Collections at Chelsea, and each issue is guest edited by a member of CCW staff. In each publication themes such as the environment and technology, as well as socially-engaged practices and identity are looked at through the lens of current arts and design practice. The first issue, Implicit Geographies, launched in summer 2014 and focused on a range of collections; private or public, professional or amateur and looked at the relations between places that objects suggest. The second issue, Thinking the Substrate, edited by Dr Daniel Sturgis, is dedicated to the idea of the substrate. The publication stemmed from a series of three symposia hosted by CCW Graduate School and held in the Green Room at Chelsea College of Arts. Over the spring term in 2014, Professor Stephen Farthing, Professor Chris Wainwright and Dr Daniel Sturgis invited artists, academics and students from across the University, together with outside guests, to think about what a substrate could be and if the substrate might be an interesting way to speak cross-disciplinarily about practice. Thinking the Substrate presents some of the discoveries from these symposia. Sturgis, together with Dibosa, asked participants from each of the sessions to either develop their papers or re-present them in a written form; not everyone who contributed to the sessions or discussions were included, which in some sense is a pity, but space was limited and there was also a desire to show divergent approaches. The one thing that everyone who attended the symposia discovered, as the reader does, is what a slippery fish the idea of substrate is. How can it mean very different things to different people – but remarkably within that breadth the substrate somehow still retains a base that links its various interpretations? It is this base that is so intriguing. Thinking the Substrate features articles by Simon Morley (Dankook University), Neil Cummings (CCW), Adrian Glew (Tate Britain), Richard Layzell (WCA), Daniel Sturgis (CCW), Pia Gottschaller (Courtauld Institute of Art) and Jo Melvin (CCW). The launch will take place from 5 – 7pm on Friday 27th March at Camberwell Space gallery, Camberwell College of Arts. This entry was posted in Events and tagged Adrian Glew, Bright Light, Camberwell Space, Daniel Sturgis, Implicit Geographies, Jo Melvin, Neil Cummings, Pia Gottschaller, Richard Layzell, Simon Morley, Substrate, Thinking the Substrate on March 26, 2015 by Claire. As editor of Studio International magazine from 1965-75, Peter Townsend oversaw its transformation from a mainstream Britain-centric publication into a vanguard journal chronicling some of the most radical artistic endeavours in the UK and internationally. In a new exhibition at Raven Row curated by CCW Reader Jo Melvin, the selection of five issues from Townsend’s editorship – April 1966, May 1968, September 1969, July/August 1970 and July/August 1972 – focuses on the role of sculpture, which over this period was a vector for profound change in art: from post-constructivism and kineticism, through the abstract formalism at St Martins School of Art in London, to post-minimalism and conceptualism. As a socialist, Townsend saw in sculpture a privileged medium to effect social change. The exhibition will revisit the role of sculpture in the definition of public space in a period when it became the flashpoint for political and social contestation. In this context, the pages of Studio International themselves played a role in shaping the debates about the limits and visibility of contemporary art. Included in Five Issues of Studio International are works by Keith Arnatt, Charles Biederman, Daniel Buren, Robyn Denny, Jan Dibbets, John Ernest, Garth Evans, Barry Flanagan, Naum Gabo, Anthony Hill, John Latham, Richard Long, Kenneth Martin, Mary Martin, Michelangelo Pistoletto, Emilio Prini, Gerry Schum, William Tucker, William Turnbull, Nicolas Schöffer, Bernard Schöttlander, Lawrence Weiner and Gillian Wise. Speaking about her process, Melvin said, ‘Peter Townsend’s preoccupations determined my selection of magazine issues, and my intention is to find a way to materialize the magazine’s discussion of how it presented, as well as affected, sculpture’s influence on the perceptions when it was at the centre of political and social debates. What role did Studio International play in shaping editorial tactics in art magazines? This boiled down question indicates the motivation for my on going engagement in reconsidering the period and how editorial policies can help to determine how we think about art. In 2008 I curated Tales from Studio International at Tate Britain, showing archival materials. However, in this exhibition, I include the some of the works referred to in the pages of the magazine. It is a unique curatorial approach, and it is interesting to mention that the 1970 issue of Studio International was defined as a “48-page exhibition”, in which six critics invited various artists to exhibit their work in the pages of the magazine. This was an “exhibition in a magazine” and for Raven Row I define my curatorial approach as the opposite a “magazine in an exhibition”. The space of encounter might be the magazine exhibition and it’s interesting to consider how dematerialization affects the sculptural encounter. And how we continue to think about what the sculptural encounter is. Five Issues of Studio International runs from Thursday 26 February to Sunday 3 May 2015. This entry was posted in Staff and tagged dematerialization, Jo Melvin, Peter Townsend, Raven Row, Studio International on February 23, 2015 by Claire. In mid-November CCW Graduate School held its second annual MPhil/PhD Intensive Week, a programme of research workshops. The week focuses on practice and aims to introduce students to the particular expertise and experience of members of CCW’s research staff. The week includes four workshops, each looking at the spaces and domains of research in art and design under the headings of Studio (Mark Fairnington), Viva (Paul Coldwell), Social Space (Marsha Bradfield) and Text and Practice (Jo Melvin). ‘The viva represents the culmination of the years of study towards a research degree and the student’s “appointment with destiny”, whereby the claims and arguments posited in the thesis can be tested,’ said Coldwell. ‘In many ways the viva is such a unique event that no amount of preparation can cover every eventuality, but a clear understanding of the process and the roles of everyone involved certainly helps. By understanding what purpose the viva serves, the student can hopefully enter into the process and enjoy the experience. After all, the whole focus of the viva is on the student’s research, and the opportunity to discuss or even “lock horns” with senior academics in the field should be an experience to savour. The idea of giving a robust defence of the thesis was explored and the manner in which the student should be seen to be taking ownership of the research territory as laid out in their thesis. Recordings of the workshops by Bradfield and Coldwell are available on Soundcloud. This entry was posted in Staff, Students and tagged Elizabeth Manchester, Jo Melvin, Mark Fairnington, Marsha Bradfield, Paul Coldwell, research workshop on December 11, 2014 by Claire. On Thursday 4 December the symposium What Work Does the Artwork Do? : Criticality & Context brings together researchers, members of activist art groups and the general public interested in the place and role of art’s criticality. Instead of asking the definitional question ‘What is Art?’, the symposium provides a space to explore and debate the roles and purposes of artworks – the work artworks do. Conceived by Reader Jo Melvin and Visiting Professor Chris Smith, the general public was invited to join the debate by contributing to Melvin’s and Smith’s open call for responses on the website, www.artandcriticality.org. A few days in advance of the symposium, Melvin considers the website responses. ‘A call to contribute to the discussion about the role of art and the work we expect artwork to do would, one might imagine, in this University of the Arts context, create a deluge of respondents. Especially when we think of how frequently we “tweet”, “like”, “blog”, all the time, day in, day out, to our “friends”. Perhaps this is a knee jerk comment, on the hoof, off the cuff, a reaction, like itching a scratch that requires little or no critical reflection. And it is effected by a simple press of the button. Nonetheless, I find it surprising that at the time of writing, only one response has been made and there have been a few tentative questions asking whether, and how, it is possible to contribute. The link to contribute is live, and can be accessed here. This entry was posted in Events and tagged Art & Language, Chris Smith, ICA, Incidents in a Museum, Institute of Contemporary Arts, Jo Melvin on December 1, 2014 by Claire. This event is the first of two Paint Club events hosted by Tate Britain this spring. It addresses the issue of what kind of working relationship contemporary artists might hope to have with the paintings (both historical and recent) in a ‘Museum’ collection. Does new painting, to gain significance, always have to genuflect to art of the past? Are works of art, once acceded to a Museum collection, insulated from further contention and reinterpretation, just as they may be rescued from the vicariousness of the marketplace? Paint Club was set up by staff and research students of UAL as a research network, open to anyone with an interest in contemporary painting. It provides a forum for the discussion of painting, its context within contemporary art practice and its relationship to research, its own history and other forms of art. Paint Club is establishing a network of research students and staff across the UK and worldwide. The next event following There’s a Ghost in my House will be on Friday 25th April, and will feature writer Barry Schwabsky and artist Clare Woods. For further details click here. This entry was posted in Events and tagged Andrew Cranston, Ann-Marie James, Dougal McKenzie, Jeff Dennis, Jo Melvin, Paint Club, Tate Britain on March 6, 2014 by Claire.